Hey, and welcome to my science-based guide on Conjugated Linoleic Acid (or just CLA for short). This is a pretty thorough guide, because it covers the science on CLA's benefits, risks, and whether or not CLA actually works for weight loss. My guide will also take you into the underground world of fake CLA supplement reviews. So just pick the topic you're interested in (the table of contents is right below) or read the guide all the way through. If you do take the time to read the whole thing, I can guarantee you'll know more about CLA than most nutritionists out there. Yes, weight loss is definitely the #1 reason why people even discover CLA. In this part of the guide, I'll cover the science on whether or not CLA actually works for weight loss. The short answer is yes, CLA can help you burn off some of that stubborn body fat. But it only will work under some pretty specific conditions. Before we get to those, let's take a look at some science that'll give you a rough idea on how much weight CLA can actually help you lose. On average, the people in the study lost 0.5 pounds (0.25 kilograms) of weight, but they did lose 3 pounds (1.7 kilograms) of fat. So while the people in the study didn't actually lose a lot of weight, they did lose some of their body fat (while gaining some new muscle mass during those 12 weeks). But this only happened because the people in the study also followed an intense exercise program (or they wouldn't be able to put on any new muscle mass). Now, let's take a look at whether or not CLA works for weight loss when there's no exercise involved. In another study , two groups of people took a CLA supplement for 12 weeks. The first group was doing 90 minutes of intense exercise three times a week, but the second group only did some light workouts. The study showed that intense-exercise group lost some extra body fat with CLA. But for the light-exercise group, CLA couldn't help the people lose any extra body fat. So it looks like CLA can only help you burn off some extra body fat if you're prepared to exercise pretty hard while taking it. But there's one more strange thing that can surprise you, even if you're prepared to exercise while taking CLA for fat burn. In one study, obese people with a Body Mass Index (BMI) higher than 25 took a CLA supplement for 8 weeks. On top of taking CLA, the people in the study exercised 3 times per week. A combination of exercise and CLA should help speed up their fat burn rate (as proven by the studies I've shown you so far). But sadly, the study showed that CLA couldn't help obese people burn off any extra body fat. The bottom line is, if you still have a lot of weight to lose, then CLA may not help you get rid of that embarrassing body fat any faster (even if you combine it with exercise). But there's one more benefit of taking CLA for weight loss you should know about. The potential to bring down your appetite, hunger, and cravings. What will CLA do to your hunger and appetite? By far the most common reason why people struggle (and ultimately fail) on most weight loss diets is the fact that those diets skyrocket their hunger and cravings. This happens because a poorly designed weight loss diet will increase the production of your hunger boosting hormone, leptin. But what does the hormone that's capable of triggering overwhelming hunger and cravings have to do with CLA? Well, one weight loss study proved that taking a CLA supplement can bring down the levels of leptin in your body. In theory, lower levels of leptin in your body should bring down the hunger and cravings (which should help you eat less food and lose more weight). The problem is, even though the CLA supplement use din the study was able to bring down the production of leptin, this ultimately didn't help people lose any extra weight. All in all, CLA can help you lose some weight, but it will only work only under some pretty specific conditions. If you're a reasonably fit person who does not have a lot of weight to lose (and you are prepared to commit to a serious exercise program), then CLA will be able to help you out. But if you still have a lot of weight to lose and hate the idea of exercising really hard, then CLA won't do much for you. At best, your hunger and cravings could be a little less intense after taking CLA, but this has yet to be proven to actually help people lose more weight. On to the scientifically proven health benefits of CLA. Welcome to the part of the guide that covers many diferent health benefits of CLA, all of which have been proven by modern science. More precisely, we'll look at whether or not CLA can help prevent (or treat) conditions like cancer, diabetes, cholesterol, fatty liver, triglycerides, inflammation and arteriosclerosis. Even in complete absence of any health issues or a medical conditions, only your doctor can confirm that taking CLA is a good idea for you. With that out of the way, let's kick things off with one of the most dreaded diseases of all times, cancer. Can CLA help prevent cancer? In one study, scientists find out that CLA may help people prevent (and make it a little easier to deal with) cancer. The problem with this study was, they didn't show which type of CLA worked against cancer. In another study , they confirmed that the best type of CLA for preventing cancer is the natural kind of CLA. Now, let's take a look on what science has to say about CLA and its influence on some different types of cancer. Plenty of studies have proven that CLA both lowers the possibility for getting colon cancer and prevents its growth . The problem with most of these studies is, they were made on animals. On top of this, the scientists only used the unnatural (synthetic) type of CLA. One study has shown that CLA-rich foods lower the risk of colorectal cancer by 13-34% . Scientists found out that CLA can reduce your chances of developing breast cancer by as much as 60% . Another study showed that CLA can slow the growth and spreading of breast cancer . Sadly, all of this has only been proven in animal studies (using the unnatural CLA supplement). So while CLA seems to have some potential against breast cancer, more human studies will need to be done on this. Time to take a look at how CLA can help out with some other dangerous health issues. Can CLA help out with diabetes? Diabetes is one of the most widespread health issues in our modern society, so let's see the effect CLA has on this dangerous condition. Some studies show that CLA helped reduce glucose and insulin levels in the blood (which would be a major benefit for any diabetic patient). Again, this effect of CLA was only proven in animal studies. On the other hand, a human study has shown that a CLA supplement COULD NOT bring down glucose and insulin levels with type 2 diabetic patients. So as far as diabetes is concerned, CLA supplements can't be recommended as a part of diabetes treatment. Let's take a look on one more thing. Does CLA have any positive effect on cholesterol and triglycerides? A study done on animals has proven that CLA can bring down total cholesterol and triglycerides. When the people in the study took a CLA supplement (the unnatural, synthetic CLA), this actually increased their triglycerides and total cholesterol (which is a very bad thing). But when the people in the study took natural CLA, their cholesterol and triglycerides didn't change (still, there was no benefit to taking CLA). The bottom line is, more research needs to be done to be sure what CLA can or can't do for your cholesterol and triglycerides. On to the connection between arteriosclerosis and CLA. Science says, taking a CLA supplement reduces some of the factors that lead to the development of arteriosclerosis. Just an interesting side note. In that particular study, scientists used margarine and butter. Both are high-fat foods, but only butter contains a lot of CLA (margarine has no CLA in it). Now, even though fatty foods in general have been linked to the development of arteriosclerosis, butter was able to reduce the risks of developing arteriosclerosis (because butter is one of the richest natural sources of CLA). So, if you're ever faced with a choice between butter and margarine, butter is clearly the smarter option. What about CLA and fatty liver disease? Fatty liver disease is one of the most common chronic diseases of the liver in the United States, so let's see what CLA can do for this problem. One study on animals proved unnatural CLA causes fatty liver. On top of this, the unnatural CLA reduced the liver's overall ability to perform its job. Based on animal studies alone (we have yet to see any human studies done on this), it looks that CLA can't really prevent the development of fatty liver. In fact, it can actually make things worse. Until more human studies are done, it's probarly best not to take CLA if you're struggling with fatty liver disease. Can CLA help you build stronger bones? According to one study on animals, CLA could help build stronger bones. It does so by boosting bone formation and by slowing down "bone resorption" (the release of calcium from the bone, which weakens your bones and can lead to osteoporosis over time). The problem is, when this potential benefit CLA was tested on humans, CLA had absolutely no effect on bone strength. So even though CLA has been proven to help build stronger bones for animals, it sadly doesn't work for humans. Let's take a look on one more potential health benefit of CLA. Research done on animals says that CLA supplementation can protect from inflammatory bowel disease. Based on animal studies, it looks like CLA could be a good choice for people with inflammatory bowel disease. But yet again, more research needs to be done on actual humans. Because, as you saw, in some cases CLA can work wonders for animals while doing absolutely nothing (or even making things worse) for humans. Time to wrap this part of the guide up. A surprisingly high number of studies have been done on the health benefits of CLA. The good news is, a lot of them have showed at least some potential of CLA for prevention of many different health conditions. The problem is, most of the scientific research so far has only been done on animals. Sadly, this makes it pretty much impossible to know whether or not CLA actually works for humans too (at least in most cases so far). All we know at this point is that natural CLA (as opposed to the unnatural, synthetic CLA found in supplements) seems to be a safer bet. Time to look at the opposite end of the spectrum. In this part of my CLA guide, we'll take a look at the scientifically proven dangers, risks, and side effects of CLA. Instead of painting a rosy picture, this part will give you an honest insight into the problems you could be running into with CLA. Again, regardless of whether or not you're struggling with a health issue or a medical condition, you need to discuss taking CLA (or any other supplement) with your own doctor. First, an example of some CLA trouble I personally know of. The reason why I even started looking into the side effects of CLA was because one of my clients ran into some trouble when taking it. She was trying to get rid of some extra body fat and she bought a couple different supplements that she believed could help speed up fat loss. Taking a couple different "fat burners" at once may (or may not) maximize fat burn, but you'll also be exposed to the risk of side effects of ALL the supplements. Anyways, after three days of taking a CLA supplement she found out that she gets stomach pains within a couple of minutes after taking a CLA pill. Naturally, I told her to stop taking CLA and I promised her to take a closer look at the science on any problems connected to CLA. As you already know, studies (on animals) have proven that CLA can increase the levels of fat in the liver. This may worsen blood sugar control and worsen insulin resistance in people struggling with diabetes. Researchers from the Centre for Synthesis and Chemical Biology (CSCB) found out that the synthetic CLA used fot the pills by the weight loss industry could throw you into a diabetic state. The natural CLA, on the other hand, won't do this to you. Scientists from Trinity Centre for Health Sciences and St. James also discovered that CLA supplements boosted their glucose levels and lowered their insulin sensitivity (which is bad news for diabetic patients). So as a bare minimum, get a blood test to check your blood sugar levels before taking a CLA supplement. If you are pre-diabetic or diabetic, then you should definitely avoid taking it. Let's take a look on one more thing. How CLA affects the cholesterol and triglycerides levels in your blood. The problem with CLA supplements and your cholesterol levels is that different studies came to completely different conclusions. Some studies have shown that CLA supplements reduce the "good" cholesterol, while others showed CLA will decrease your good cholesterol levels. This might have happened because different CLA supplements were used in the studies. But at this point, you simply can't be sure either way. So yet again, if you want to start taking a CLA supplement, talk to your doctor and check your before/after cholesterol levels. CLA supplements can cause you to bleed out of your nose and can slow down the healing of your wounds. If you're struggling with a bleeding disorder you should be extra careful with CLA, though this can also be a problem even for perfectly healthy people. This problem can be made even worse if you take a CLA supplement with herbs that increase the risk of bleeding. Ginkgo biloba, garlic and saw palmetto are just some examples of such herbs. Because CLA can cause extra bleeding during and after surgery, it's best to stop taking CLA supplements at least 2 weeks before any kind of surgery. On to how CLA effects kids and pregnant/breastfeeding women. Is it safe to take a CLA supplement during pregnancy/breastfeeding? During pregnancy, many woman are afraid to put on too much weight. Some women turn to weight loss products even as they're still pregnant or breastfeeding. At this point, we can’t know if CLA supplements will hurt the unborn or breastfeeding baby, simply because no studies have looked at the CLA effects on this yet. Again, if you are thinking about taking a CLA supplement during or after pregnancy, be sure to talk to your doctor about it. In one medical case, doctors connected quite a few serious health risks and side effects with taking a CLA supplement. A 46-year old healthy woman started taking a CLA supplement because she wanted to get rid of her body fat. After 14 days she had symptoms of asthenia, nausea, anorexia, jaundice, and pruritus. The biopsy of her liver showed she also developed hepatoxicity. Soon after she stopped taking CLA, the levels of enzymes in her liver returned to normal. If you notice any of these side effects when taking a CLA supplement, you should stop taking CLA immediately and go to your doctor for help/advice. As you saw, CLA has the potential to cause some pretty serious side effect. Talk to your doctor before taking a CLA supplement, especially if you're struggling with diabetes, fatty liver disease, or high cholesterol levels. And even if you don't have any health issues, only your doctor can confirm taking a CLA supplement is a good idea for you. It's time to take a look at how to recognize fake supplement reviews. If you were searching the web for some honest CLA supplement reviews from real people, then this part of the CLA guide will be perfect for you. Read it all the way through and you'll be surprised to find out that most positive CLA reviews are fake. You'll also see where those fake reviews are coming from and why huge online stores like Amazon can't (or won't) do more to get rid of them. And relax, this isn't some crazy conspiracy theory I've come up with just to make my website more interesting. You've already seen lots (and will see more) of real science that proves my claims. According to Local Consumer Review Survey of 1,062 people, 84% of people trust online reviews as much as a personal recommendation. Just think about this. A huge majority of people trust online reviews of a product as much as if their friends, coworkers, or their family recommended it to them. So, what do you think happens if the reviews for any CLA supplement look like this? With lots of 5 star reviews to "prove" that their product is beyond awesome, the company (or the person) behind it is bound to make a killing. The one thing that thousands of positive CLA reviews have in common, is the claim that CLA can supposedly speed up weight loss. Here's one example of a stellar CLA supplement review that probably helps brings in a ton of sales on its own. You don't need to spend years in the weight loss industry (like I did) to know that before and after photos are the ultimate selling machine. You can go on and on about the amazing benefits of your weight loss product. You can even back all your claims up with real science. But without any before and after photos, your sales will be minimal at best. So let's take a look at what real science has to say about taking a CLA supplement for weight loss. 50 pounds of fat gone in less than 2 months! I'm a true believer, Naturewise have beyond exceptional products! I paired this with Garcia Cambogia and a good diet and exercise and the results have been unbelievable so far! First of all, some simple math can tell you that losing 50 lbs of pure body fat in less than 2 months is pretty much impossible. Second of all, you already saw the science on the limited benefit of CLA for fat loss (that's IF you combine it with an intense exercise program), while Garcinia Cambogia has also been proven NOT TO WORK for weight loss by modern science. Where do fake CLA supplement reviews come from? 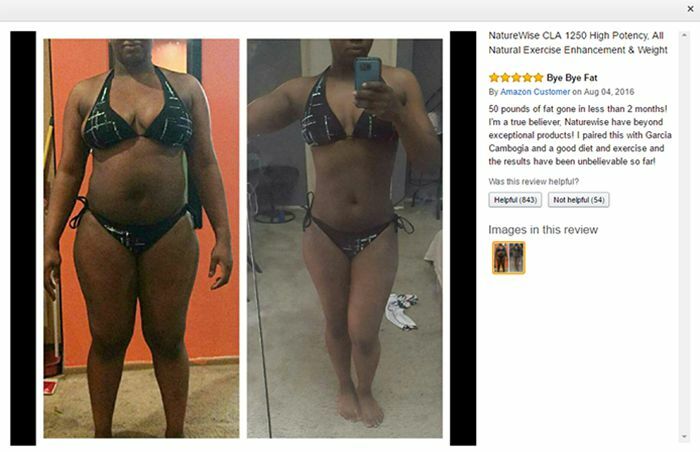 You now know that if you wanted to make a killing selling CLA supplements on Amazon, you'd need lots of stellar reviews. 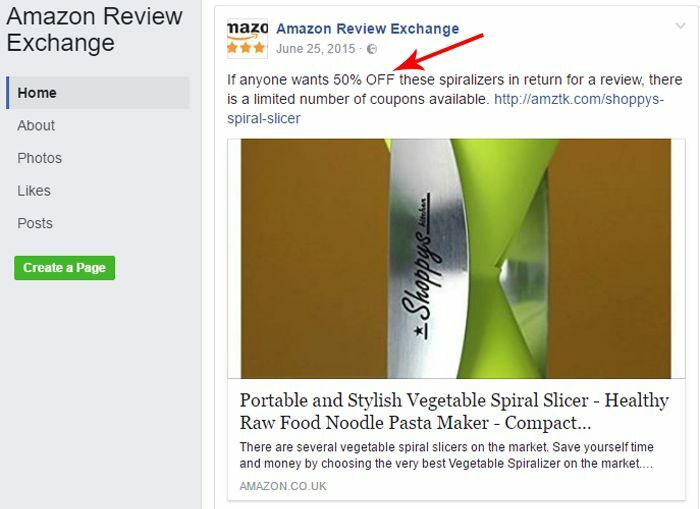 Now, there are lots of legit ways of getting those reviews that do not result in fake reviews (you can rely on those if your product actually works). So if you have an email list of everyone that bought your product and you ask them to write an honest review, there is nothing wrong with that. But here, we'll focus on the more shady tactics of getting reviews for a product. 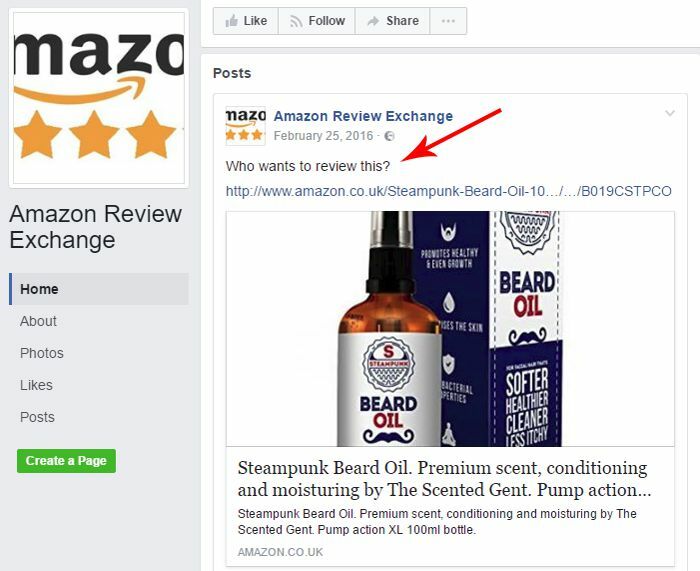 Let's start with one of the easier ways, Facebook review exchange groups. How do groups like these work? First, you have to join the group. Then, after you're accepted, you have to find somebody who'd be willing to exchange reviews with you. Usually, you then have to buy their product and in return, they'll buy yours. After you become each other's "customers", you both write stellar reviews for the products. But there's another type of review exchanges going on. Here's an example of a product manufacturer that offers a hefty discount (50%) in exchange for a review. But wait, is offering 50% off as an incentive for somebody to write a review really that bad? The problem with offering just about any kind of reward for a review automatically boosts the chances of getting a good review. Because, if you give somebody a huge discount for a product or a service, they'll feel "indebted" to you. They'll automatically want to give you a good review and avoid mentioning negative stuff about your product. Now, maybe you care a lot more about CLA reviews than about oil sprayers, but you still get the idea. If you don't have to spend a dime on the product, of course you're going to feel like you "owe" a review to the person who gave it to you. And of course you're going to want to give a good review and try to keep any negative stuff to yourself. Like I said, Amazon agrees with me that getting a review in any of these shady ways can result in countless fake reviews. 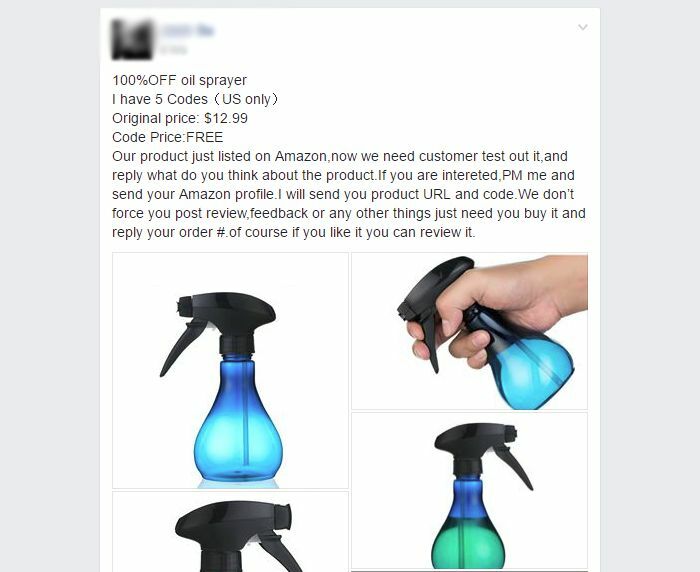 Why aren't online sellers like Amazon stopping fake reviews? Well, it's not that online retailers like Amazon don't care about fake reviews. If too many Amazon's customers buy crappy products (based on fake product reviews), they'll start trusting Amazon less and less. But is this enough to get rid of the fake reviews Amazon? Amazon owes a huge part of its success to the fact that they allow anyone (yes, even people like you and me) to sell just about any product online. Because of this, Amazon currently carries hundreds and millions of products in thousands of different categories. Out of all those products, some of the more popular ones have thousands of different reviews written about them. So no matter how determined Amazon may be to weed out fake reviews, it's simply impossible to expect they could actually fact-check each and every single review. As you saw, Amazon clearly states they're are against fake reviews. What do you think would happen if Amazon really removed all the reviews that have been proven to be false by modern science? 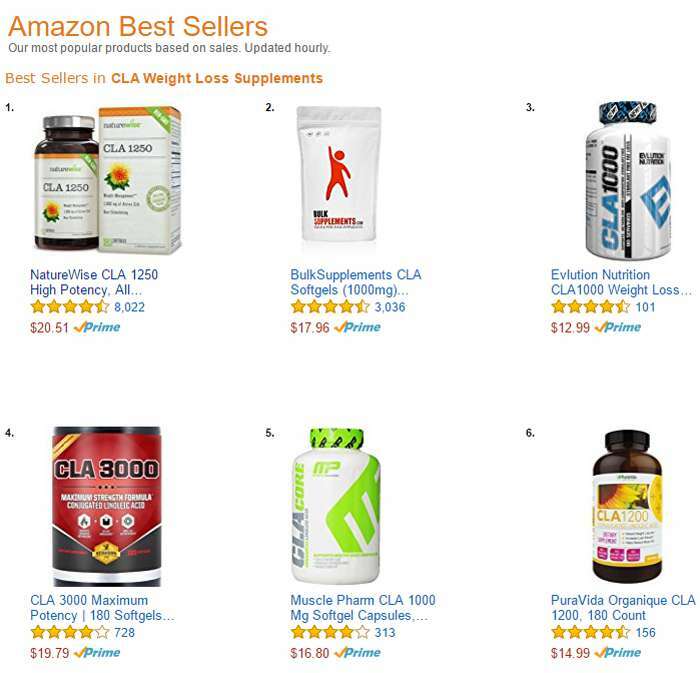 Without so many stellar reviews boosting the sales of CLA supplement "Best Sellers" Amazon would most probably have to face a huge sales drop. Because of this simple fact, Amazon may not be all that eager to 100% wipe out false reviews after all. But how can you separate between false and real CLA supplement reviews? How to recognize fake supplement reviews? Well, unless you know how to do your own research, it can be tough to separate between real and fake supplement reviews. As you saw, it's not just relatively easy to come up with fake reviews. But some well-meaning people actually believe that it was the CLA supplement that worked for them. That's in spite the fact that science says it was far more likely that dieting or exercising did the job. So no matter how hard you, me, or even Amazon try, we might not be able to separate fake reviews from real ones. Always compare the claims made in online reviews with science-based guides like the one you're reading now. Because the best antidote for fake supplement reviews is real science. I, for one, intend to keep publishing the truth, even though I might make far less money that somebody who makes millions selling stuff that doesn't really work. in this part of the guide, I will go over some of the best and richest sources of CLA. And just in case you're wondering, there is no official recommendation on how much CLA you should be getting in every day. I guess that's because CLA isn't as critical to our survival an well being as some of the more vital other nutrients. Still, I've collected enough science for us to know how much we need to take to enjoy at least some of the benefits I've covered in this guide. But first, we have to return to the basics. Conjugated Linoleic Acid, or just CLA for short, is a "good" fat that helps keep your metabolism going. CLA is an essential fat, meaning your body can't produce it, but you can find it in some foods (and of course, in lots of supplements). Before we get to which foods contain CLA (and how much), let's take a look at one of the biggest source of confucion about CLA. What most people don't know is that there are at least 28 different forms of CLA. Techincally, they're called "isomers". Now, even though these 28+ CLA isomers look quite similar to each other, they can have a completely different effect on your body. I already showed you an example where CLA has been proven to both raise and drop your cholesterol levels. Most likely, this happened because different CLA isomers were used. In other words, you can't just randomly pick a CLA supplement and expect it to work (for whatever reason you're taking it). Scientists found out that best sources of natural CLA are milk, cheese, and meats. The richest CLA meat is beef, but it is also found in lamb and veal and in pork, chicken, and turkey. The richest dairy product in CLA is butter. If you eat a "nutritionally complete" diet, you'll get enough CLA to cover your body's basic needs. But if you want to enjoy the extra health benefits of CLA, some studies have shown that you need to get in at least 1.5 g of CLA per day. In America, the average intake is only about 0.15 g per day for women and 0.21 g for men, which is way too low to get any extra beenfits from it. The problem many people don’t get enough CLA from food is because their meals are mostly made up of boxed, frozen and fast foods. As you can see from the table above, the best sources of CLA can also also very fattening. For example, to eat 1.5 g of CLA, you'd have to eat around 300 g of butter, or over 2 pounds of cheese. Now, you may be a cheese lover. But I bet you don't like it nowhere near enough to eat two pounds of it day in and day out. Needless to say, the calories you'd be getting in with that much dairy, would shoot your weight up faster than you can say "cheese". The bottom line is, even if you ate lots of fatty CLA-rich foods, it would be hard for you to get in even 1 gram of CLA per day. The concentration of CLA in natural foods (meat and dairy) depends on the season, what the animals were fed, and the animal's age. Grass is rich in linoleic acid and the special enzymes in the digestive system of the animal convert linoleic acid to CLA. Because of this, milk from grass fed cows can have as much as 500% more CLA than milk from grain fed cows. Also, free-range meats are widely known to be the healthiest meats available. So ask your local butcher for grass-fed beef or check the food labels yourself. Whenever you can, choose grass-fed meat over grain-fed meat, and you'll maximize the amount of natural and safe CLA you're getting in. The richest, safest and natural sources of CLA are meats and dairy. And while it's easy to satisfy your body's basic needs for CLA by eating a balanced diet, it's tough to get in enough CLA to enjoy any extra benefits of it. If you want to up your CLA intake with natural foods (but without having to eat too many calories), you should stick with grass-fed meats that were neve processed (frozen). 1. Blankson H, Stakkestad JA, Fagertun H, Thom E, et al. Conjugated linoleic acid reduces body fat mass in overweight and obese humans. J Nutr 2000;130:2943-2948. 2. Thom E, Wadstein J, Gudmundsen O. Conjugated linoleic acid reduces body fat in healthy exercising humans. J Int Med Res 2001;29:392-6. 3. Ribeiro AS, Pina FL, Dodero SR, Silva DR, et al. Effect of conjugated linoleic acid associated with aerobic exercise on body fat and lipid profile in obese women:A randomized, double-blinded, and placebo-controlled trial. Int J Sport Nutr Exerc Metab 2016;26(2):135-44. 4. Medina EA, Horn WF, Keim NL, Havel PJ, et al. Conjugated linoleic acid supplementation in humans: effects on circulating leptin concentrations and appetite. Lipids 2000;35:783-788. 5. McGuire MA, McGuire MK. Conjugated linoleic acid (CLA): a ruminant fatty acid with beneficial effects on human health. Proceedings of the American Society of Animal Science, 1999. 6. Parodi PW. Cow's milk fat components as potential anticarcinogenic agents. J Nutr 1997;127:1055-1060. 7. Bhattacharya A, Banu J, Rahman M, Causey J, et al. Biological effects of conjugated linoleic acids in health and disease. J Nutr Biochem 2006;17:789-810. 8. Ip C, Chin SF, Scimeca JA, Pariza MW. Mammary cancer prevention of conjugated dienoic derivative of linoleic acid. Cancer Res 1991;51:6118-6124. 9. Visonneau S, Cesano A, Tepper SA, Scimeca JA, et al. Conjugated linoleic acid suppresses the growth of human breast adenocarcinoma cells in SCID mice. Anticancer Res 1997;17(2A):969-73. 10. Houseknecht KL, Vanden Heuvel JP, Moya-Camarena SY, Portocarrero CP. Dietary conjugated linoleic acid normalizes impaired glucose tolerance in the Zucker diabetic fatty fa/fa rat. Biochem Biophys Res Commun 1998;244(3):678-82. 11. Sher J, Pronczuk A, Hajri T, Hayes KC. Dietary Conjugated Linoleic Acid Lowers Plasma Cholesterol during Cholesterol Supplementation, but Accentuates the Atherogenic Lipid Profile during the Acute Phase Response in Hamsters. Jour Nutr 2003;133(2):456-460. 12. Tricon S, Burdge GC, Kew S, Banerjee T, et al. Opposing effects of cis-9, trans-11 and trans-10, cis-12 conjugated linoleic acid on blood lipids in healthy humans. Am J Clin Nutr 2004;80:614-20. 13. Nakamura YK, Flintoff-Dye N, Omaye ST: Conjugated Linoleic Acid Modulation of Risk Factors Associated With Atherosclerosis. Nutr Metab. 2008, 5: 22-30. 10.1186/1743-7075-5-22. 14. Lasa A, Simón E, Churruca I, Fernández-Quintela A1, et al. Effects of trans-10,cis-12 CLA on liver size and fatty acid oxidation under energy restriction conditions in hamsters. Nutrition 2011;27(1):116-121. 15. Watkins BA, Seifert MF. Conjugated linoleic acid and bone biology. J Am Coll Nutr 2000;19:478S-486S. 16. Doyle L, Jewell C, Mullen A, Nugent AP, et al. Effect of dietary supplementation with conjugated linoleic acid on markers of calcium and bone metabolism in healthy adult men. Eur J Clin Nutr 2005;59:432-440. 17. Bassaganya-Riera J, Hontecillas R. Dietary conjugated linoleic acid and n-3 polyunsaturated fatty acids in inflammatory bowel disease. Curr Opin Clin Nutr Metab Care 2010;13(5):569-73. 18. Risérus U, Arner P, Brismar K, Vessby B. Treatment with dietary trans10cis12 conjugated linoleic acid causes isomer-specific insulin resistance in obese men with the metabolic syndrome. Diabetes Care 2002;25(9):1516-21. 19. Ramos R, Mascarenhas J, Duarte P, Vicente C, et al. Conjugated linoleic acid-induced toxic hepatitis: first case report. Dig Dis Sci 2009;54(5):1141-3. 20. Heymsfield SB, et al. Garcinia cambogia (hydroxycitric acid) as a potential antiobesity agent: a randomized controlled trial. J Am Med Assoc 1998;280:1596-1600. 21. Chin SF, Liu W, Storkson JM, Ha YL, et al. Dietary sources of conjugated dienoic isomers of linoleic acid, a newly recognized class of anticarcinogens. J Food Compos 1992;5:185-197. 22. Ritzenthaler KL, McGuire MK, Falen R, Shultz TD, et al. Estimation of conjugated linoleic acid intake by written dietary assessment methodologies underestimates actual intake evaluated by food duplicate methodology. J Nutr 2001;131(5):1548-54. 23. Dhiman TR, Anand GR, Satter LD, Pariza MW. Conjugated linoleic acid content of milk from cows fed different diets. J Dairy Sci 1999;82(10):2146-56.